← Reconciliation Ecology: A prospect for Wellington resident humans and birds. In conservation, the term non-native tends to evoke a knee-jerk association with the keywords: unwanted, invasion, eradication, pest. Particularly here in New Zealand, the experience with introduced species has been extremely negative, resulting in the loss of many species and the complete disruption of an ecosystem. The line between introduced species and invasive species has proven difficult to define as (like many terms in ecology) the definition can be ambiguous and open to subjective interpretation (Colautti & MacIsaac, 2004). Some define invaders broadly as a widespread non-indigenous species, whilst others limit the term to species that adversely affect habitats economically and ecologically (Colautti & MacIsaac, 2004; IUCN, 2013). Invasive species are one of the three main threats to global biodiversity, along with habitat loss and climate change. The introduction of new species to a non-native ecosystem can have devastating flow-on effects throughout the community and can result in both environmental and economic damages. But what happens when a species is considered invasive in one area of the world but considered threatened in another? There are several examples of both plant and animal taxa which have been successful invaders of new locations yet are experiencing declines in their native habitat. As climates continue to shift, this may become a more and more frequent occurrence when native areas become less suitable and new climatic envelopes in non-native areas become accessible. Brook trout, Monterey Cypress, and Chinese wattle-necked softshell turtles highlight these paradoxes. All three of these have managed to become established in island settings where introductions can be particularly consequential.These examples also raise questions about ex situ conservation, or practicing conservation through relocation, and weighing the costs of an introduced species and deciding whether or not to preserve them outside their native range. Brook trout (Salvelinus fontinalis) are a species of char native to eastern North America, inhabiting clear, cool freshwater lakes, rivers, streams, and ponds. While their historic range is limited to the East coast of the United States and Canada, they have been introduced to over 47 countries spanning Europe, South America, Africa and Oceania where they are classified as an invasive and damaging species (ISSG, 2014). Originally introduced to provide recreational and commercial fishing, not all introductions led to establishment but populations are now present throughout the United States, Europe, and New Zealand (EBTJV, 2013). There are many cases of brook trout out competing native species in introduced regions. Non-native brook trout displace bull trout (Salvelinus confluentus) at high elevations within introduced areas throughout the western United States and Canada (Rieman et al., 2006; Warnock & Rasmussen, 2013). In their native range extending from southern Canada to South Carolina, habitat fragmentation, invasive species, and climate change are causing declines in brook trout populations. Ironically, non-native fish rank as the largest biological threat to brook trout (EBTJV, 2013). Declines in brook trout in native areas have been observed due to interspecific competition and predation on juveniles by brown trout (Salmo trutta) (Fausch & White, 1981). Increased sedimentation and runoff are likely to be contributing factors to the diminished populations, with higher water temperatures due to industrial runoff and climate change driving the populations to higher elevations. Climate change will continue to restrict the native range of the brook trout, increasing minimum elevation by up to 714 m in the southern native boundary, meaning further reduction of populations within native habitats (Meisner, 1990). Native range (orange) and introduced range (red) of brook trout (Salvelinus fontinalis) in the United States. Monterey Cypress (Cupressus macrocarpus) is a species of cypress native to California that thrives in mild and humid climates. The historic distribution of Monterey Cypress forests once spanned the1400 kilometer-long stretch of the California coast from Marin County to Baja California (Graniti, 1998). 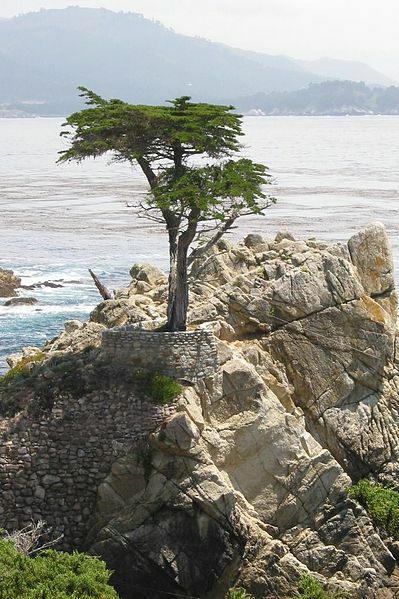 One of the few remaining Cupressus macrocarpus in Monterey California. The present native distribution is now restricted to a dismal 3.2 kilometer strip on the Monterey Peninsula, where only two relict populations remain (Farjon, 2013). According to the IUCN Red List, the species is classified as threatened and vulnerable with the main forces of the reductions being fire damage and the spread of fungal disease (Farjon, 2013). Cypress canker (Seiridium cardinale), a pathogenic fungus, attacks trees in the cypress family by causing girdling cankers and eventually death of the tree (Graniti, 1998). While the populations in it’s native territory are dwindling, Monterey Cypress has managed to successfully establish elsewhere. Macrocarpa has been introduced all over the world for use as ornamental trees, windbreaks, and timber (Graniti, 1998). One of the most notable introduction was to New Zealand, where populations flourish. Monterey Cypress was introduced to New Zealand in the 1860s and has since naturalized, finding the climate to be more suitable than that of its native habitat (Wassilleff, 2013). But even in New Zealand, Monterey Cypress has suffered losses due to the spread of cypress canker, causing it to lose popularity for use as timber (Farjon, 2013). Despite the influx of canker in the 1970s, Monterey Cypress still persists throughout rural New Zealand (NZPCN, 2010). The native range of the Chinese wattle-necked softshell turtle (Palea steindachneri) is from the Guangdong region in China down to northern Vietnam. The species is established on Mauritius and the Hawaiian islands Kauai and Oahu, thriving in the warm climate (Ernst & Lovich, 2009). Brought over in the 1800s by Chinese immigrants as a food source, the species has been long established, yet little is known about their present abundance (McKeown & Webb, 1982). P. steindachneri is an introduced species, and is considered to be potentially invasive, although little is known about their impact and there has been limited research into the ecology and behaviour of the species (Engstrom, 2013; Ernst & Lovich, 2009). Because there is no data available on the growth cycle, population dynamics, or predatory behaviour, it is difficult to estimate the impact their introduction has had and could have on native biota. Current research, led by Dr. Tag Engstrom and Dr. Michael Marchetti from the Center for Ecosystem Research, is investigating the distribution of the softshell turtles on the Hawaiian Islands and their effect on the local ecosystem dynamics (Engstrom, 2013; Radford, 2011). The wattle-necked softshell turtle is currently listed as endangered on the IUCN Red List due to high demand for turtle products throughout Asia, particularly within China (ATTWG, 2000; Shi et al., 2008).The market for softshell turtle meat for use in traditional Chinese food and medicine is the leading cause of the dramatic population declines. The ongoing capture and trade of the endangered species means that it is unlikely to succeed within its native habitat (Radford, 2011; Shi et al., 2008). The research by Dr. Tag Engstrom and Dr. Michael Marchetti is investigating the invasion/conservation paradox of the softshell turtle and its potential for preservation in its “new” homeland, leading the conversation for the conservation conundrum. Traditional methods of ex situ conservation involve the translocation or removal of part of a population from its natural habitat to a less threatened location for the preservation of genes or populations. Drawbacks associated with traditional ex situ conservation lie in the inability of the species to thrive within its new habitat due to specific environmental needs. Within the invasion/conservation paradox, the threatened species has already found a more suitable non-native habitat where it has successfully established. Instead of kicking out the intruder, perhaps the populations can be managed closely to allow their persistence. Within the invasion/conservation paradox, there must be an assessment of risks and benefits, as with many practices of conservation ecology. Do we risk an ecosystem to save one alien species? Or do we eradicate the invader – as most methods of conservation teach – but then risk losing that species entirely? The key is understanding the full impact of the introduced species on the ecosystem it is invading. This is often easier said than done. The complexity of ecosystems and our inability to completely understand all underlying interactions and potential effects makes in difficult for us to anticipate all consequences of introduced species. As with the wattle neck soft-shelled turtle, the species has been naturalized for nearly two centuries and we still don’t know what effects, if any, it has had upon the Hawaiian ecosystem. Yet other species, such as the Monterey Cypress in New Zealand, seem to be perfectly at home within their new habitat without having serious consequences for the native flora and fauna. And then there is the Brook trout, that whilst being damaging to native fishes, is likely to persist in introduced areas due to the demand by anglers. Should this be taken as an opportunity for conservation? Situations where the non-native species is not considered to be highly detrimental to the native biota create an interesting and new concept of ex situ conservation that could challenge the traditional perception of introduced species. This is a new concept in biology, that requires more questions to be asked, more species to be reevaluated, and more exploration into the many paradoxes that come with the responsibility of conservation. Colautti, R., & MacIsaac, H. (2004). A neutral terminology to define ‘invasive’ species. Diversity and Distributions, 10, 135-141. Ernst, C., & Lovich, J. (2009). Turtles of the United States and Canada (2nd ed.). Baltimore, Maryland: John Hopkins University Press. Farjon, A. (2013). Cupressus macrocarpa IUCN 2013 (Version 2013.2 ed. ): IUCN Red List of Threatened Species. Graniti, A. (1998). Cyrpess canker: a pandemic in progress. Annual Review of Phytopathology, 36, 91-114. McKeown, S., & Webb, R. (1982). Softshell turtles in Hawaii. Journal of Herpetology, 16(2), 107-111. Radford, C. (2011). The endangered wattle-necked softshell turtle (Palea steindachneri) throughout the Hawaiian Islands (Master of Science Thesis), California State University. Wassilleff, M. (2013). Trees in the rural landscape – Macrocarpa and other conifers Te Ara – the Encyclopedia of New Zealand.